With just enough room to keep a dinner party's worth of bottles handy, this decorative black metal wine display rack provides stylish storage for an evening's selection while taking up minimal countertop space. Subtle leaf embellishments evoke the vineyard, and the unique circular shape make this bottle holder an attractive addition to the dining room or kitchen decor. A small handle permits easy carry from kitchen to patio when entertaining outdoors. 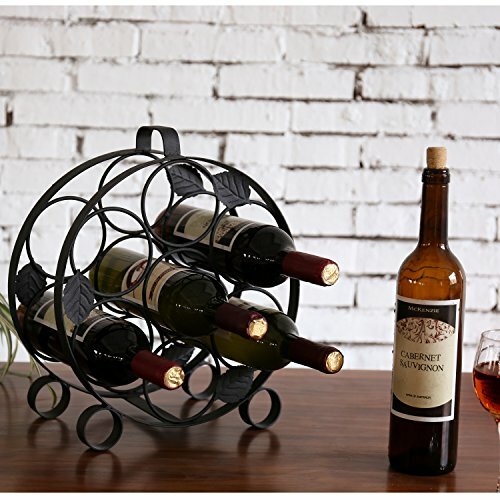 Perfect as a gift for the dedicated oenophile, this metal wine bottle stand makes the welcoming statement that there's always a good bottle close at hand. Approximate Dimensions (in inches): 13.6 H × 11.8 W × 6.3 L.
A modern countertop wine rack in black metal with circular design. Holds up to 7 wine bottles. Unique circular design and leaf embellishments add vineyard-evoking charm to kitchen or dining room. Features a decorative circular design and a classic black finish, adding a touch of modern charm. Approximate Dimensions (in inches): Overall - 13.6 H x 11.8 W x 6.3 L.